"Warning Sign" redirects here. For other uses, see Warning Sign (disambiguation). For a sign on a boat or building relating to it or its contents, see placard. While warning traffic sign designs vary, they usually take the shape of an equilateral triangle with a white background and thick red border. In the People's Republic of China (except for Macau and Hong Kong), they appear with a black border and a yellow background. In Sweden, Serbia, Bosnia and Herzegovina, Greece, Finland, Iceland, North Macedonia and Poland, they have a red border with an amber background. The polar bear warning sign in Svalbard recently changed from displaying a black bear on white background to a white bear on black background (both signs are triangular with a red border). Some countries (like France, Norway and Spain) that normally use a white background have adopted an orange or amber background for road work or construction signs. 17th-century sign along Salvador Street in Alfama, Lisbon says "Year of 1686. His Majesty commands all coaches, seges and litters coming from Salvador's entrance to back up to the same part"
Early Czech warning signs, c. mid-1930s. The blue signs were later supplanted with red-white-black signs. Some of the first roadside signs—ancient milestones—merely gave distance measures. Hazard warnings were rare though occasional specimens appeared, such as the specific warning about horse-drawn vehicles backing up which was carved in stone in Lisbon's Alfama neighborhood in 1686. The early signs did not have high-contrast lettering and their messages might have been easily overlooked. 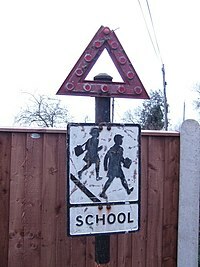 Signs were written in the local language (example); symbolic signs, though long used on certain tradesmen's signs (like the pawnbrokers' tri-ball symbol) were to be used for traffic only much later in history. Complex signage systems emerged with the appearance of motorcars. In 1908 the automobile association in West London erected some warning signs. 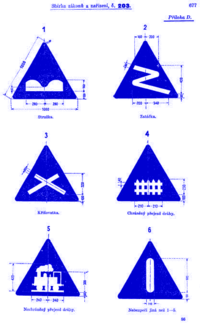 In 1909, nine European governments agreed on the use of four pictorial symbols, indicating bump, curve, intersection, and railroad crossing. The intensive work on international road signs that took place between 1926 and 1949 eventually led to the development of the European road sign system. As the 20th century progressed, and traffic volume and vehicle speeds increased, so did the importance of road sign visibility. Earlier flat-painted signs gave way to signs with embossed letters, which in turn gave way to button copy signs—round retroreflective "buttons" helped to achieve greater night visibility. Flat metal signs reappeared in the 1980s with the widespread use of surfaces covered with retroflective sheeting materials like Scotchlite. In Europe, the 1968 Vienna Convention on Road Signs and Signals (which became effective in 1978) tried, among other things, to standardize important signs. After the fall of the Iron Curtain and greater ease of country-to-country driving in the EU, European countries moved toward lessening the regional differences in warning signs. In modern regulations, U.S. warning signs are classified as Series W signs, such as: W1 Series (curves and turns), W2 Series (intersections), W22 Series (blasting), et cetera, ending with the W25 Series (concerning extended green traffic lights). Some U.S. warning signs are without category while others like the warning stripes at tunnel portals or plain red End of Roadway signs are classified as Object Markers (OM Series). In the U.S., Stop and speed limit signs fall under the R Series (Regulatory). Modern U.S. signs are widely standardized; unless they are antique holdovers from an earlier era, oddities like a yellow Stop sign or a red Slippery When Wet sign would typically appear only on private property—perhaps at a hospital campus or in a shopping mall parking lot. Street sign theft by pranksters, souvenir hunters, and scrappers has become problematic: removal of warning signs costs municipalities money to replace lost signs, and can contribute to traffic collisions. Some authorities affix theft-deterrence stickers to the back sides of signs. Some jurisdictions have criminalized unauthorized possession of road signs or have outlawed their resale to scrap metal dealers. In some cases, thieves whose sign-removal lead to road fatalities have been charged with manslaughter. Artistically inclined vandals sometimes paint additional details onto warning signs: a beer bottle, a handgun, or a boom box added to the outstretched hand of the Pedestrian Crossing person, for example. 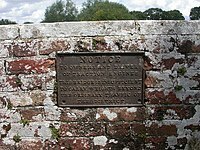 Wikimedia Commons has media related to Warning sign. General warning signs are used in instances in which the particular hazard, obstacle or condition is not covered by a standard sign. In Europe, they usually comprise an exclamation mark on the standard triangular sign (Unicode #9888: ⚠) with an auxiliary sign below in the local language identifying the hazard, obstacle or condition. In countries using diamond-shaped signs, the explanatory language is often written directly on the diamond-shaped sign, although it may contain only a general warning such as "Caution", and pictograms may also be used. Warning signs can be placed in advance of, next to or on a specific obstacle. Obstacles such as railway level crossings may have several warning signs beforehand, while bridge ramparts typically have reflective signs placed directly on them on either side. These signs can be specific to the shape requirements of the obstacle, for example, bridge rampart signs are often tall and skinny so as not to intrude into the lane. These signs warn of wild animals (moose, bear, elk, deer, reindeer, polar bears, camels, wallabies, kangaroos, alligators, etc.) or farm animals (cows, horses, ducks, sheep) that may stray onto the road. In the United States, a "share the road" plaque is sometimes placed below these warning signs when used in this manner. These signs are found where road users could encounter slow, large or non-typical vehicle such as tractors, forklifts, snowmobiles, Amish buggies etc. They are more common around quarries, airports, industrial zones and rural areas. These signs are often temporary in nature and used to indicate road work (construction), poor roads, or temporary conditions ahead on the road including: flagmen, survey crew, single-lane, detour, bridge out, utility crew ahead, blasting area, bump, dip, frost heaves, flooding (with signs labeled "High water"), soft shoulder, uneven pavement, freshly oiled road, loose gravel, smoke on road, trucks entering, etc. (Note that some "high water" signs are posted to alert drivers of a flood-prone area and do not actually mean that there is a flooded section of road ahead.) In France, Italy, Spain, Norway etc., warning (and speed limit) signs connected with road work have a yellow background in place of the usual white background on signs. In America and Ireland, signs connected with road work have an orange background. These signs indicate that dangerous or unexpected bends in the road are ahead. Signs typically indicate whether the curves are to the right or to the left, the angle of the curve and whether it is one curve or a series of curves. Chevron-shaped symbols or arrows on rectangular signs may be placed at the actual location of the bend or curve to further mark the location of the curve and to assist in the negotiation of the curve. They may also be used to indicate "merge" with other traffic, as for an on-ramp of a limited-access highway. An unusual occurrence of the rectangular arrow sign appears on the eastbound approach to Dead Man's Curve in Cleveland, Ohio, USA, a curve so sharp that in places an arrow's stem is printed on one sign and the arrow's point is printed on another larger sign further down the road; from the driver's perspective at a distance the two signs visually blend together to form one large arrow image. These signs are used to indicate tunnels, where lights are usually required, and a general change in the light level. May also indicate low ceiling clearance. Truck drivers should also watch for prohibited cargo signs (e.g., hazmat, propane, explosives) upon approach to tunnels. These signs are used where traffic may be constricted to a narrow bridge, or where the bridge may have a movable span closed to vehicles while boats pass (e.g., drawbridge or floating bridge). They may also be used for underpass to indicate low overhead clearance. These warning signs indicate that traffic lights are ahead, and are often used when it is difficult to see that a traffic light may already be showing red, to warn a driver to prepare to slow down. They may be supplemented with flashing light or lighted sign when light is red or turning red. Some countries also have signs warning of signals for ramp meters, fire stations, and airfields. As for traffic signals, above, some "stop" or "yield" signs may require additional warning or reminder, especially in dense areas or where the sign has been added recently. These signs warn of road crossings at (crossroads, T-intersection, forks (Y-intersection), rotary/roundabout). They may also indicate "hidden driveway" intersecting the road ahead. (Compare with bridges, overpasses, viaducts). These signs indicate when a multilane highway is being narrowed, when a passing lane is ending, or where the road is widening or a passing lane starting. Another type of sign is used to indicate central "two-way" left turning lane in center of roadway. Warning signs may also warn of "Highway ends", where the road changes class or type. In the United States and Canada, there is special signage for lanes that are about to exit, so that drivers who wish to remain on the main road have adequate time to merge. Such lanes are sometimes indicated by special striping ("alligator stripes") and the sign, "Through Traffic Merge Left" (or right). On freeways, the green directions sign for the exit ramp may have the additional notation, "Exit Only," and should have black letters on a yellow background for emphasis. Roadways that only have one entry/exit point - "dead end", "not a through street" or "no outlet". Signs indicating the end point of a roadway. In California, United States near the Mexican border, there are warning signs showing a running family. This is to warn motorists to look out for illegal immigrants who try to escape authorities by running through freeway traffic. The symbol was created by California Department of Transportation employee John Hood in the late 1980s. These signs mark school zones (in which lower speed limits may be in place), student crossings, crossing guards or signals ahead. In the U.S. and Canada, pentagon-shaped signs are used in place of the usual diamond-shaped signs. The shape of the U.S. school zone resembles a one-room schoolhouse and is the only U.S. sign shaped this way. Some Canadian provinces use an identical sign. Ontario uses a white on blue version of this sign. Bicycle crossing signs warn that bicycles will cross at their location. These signs warn of approach to where firefighters may be entering the road with fire engines or other emergency apparatus, where other drivers will have to stop and wait until they pass. These signs may be used to warn people of oncoming traffic; shown when a motorway becomes a dual carriageway or a normal road without a central reservation or median. These signs are used to warn of level crossings ahead. In most countries, a red triangle warning sign is used, with various pictograms for unguarded crossings, crossings with manual gates, and automatic level crossings. In most of Europe, an old-style gate is used for a crossing with gates, and a steam locomotive for a crossing without gates. Germany uses an electric train. Similar pictograms are also used in Ireland, albeit on an amber diamond sign. In the United States the warning of all types of railway crossings is made using a circular yellow sign. The actual crossing is also marked with crossed "railroad crossing" crossbuck signs (stop, look, listen) and possibly lights, bells, and barriers. These signs may be used to indicate the hazards of fallen or falling rocks on the road ahead. They are usually pictographs, but may also include wording, such as "fallen rock", "falling rock", or "rock slide". In Italy the words may be "caduta sassi" or "caduta massi"; in France "chûte de pierres"; in Mexico "derrumbes". For example, a warning sign with the image of an aircraft in the middle of it indicates an airport or airfield, where drivers should be prepared for low-flying aircraft. Flying socks, as indicated by a windsock on red triangle or yellow diamond signs, indicate locations where a strong side wind may cause the trajectory of the moving vehicle to change drastically, perhaps even "flying" across lanes, causing an accident. "Slippery when wet", "grooved pavement" (warning to motorcyclists and bicyclists), "Open joints on bridge", "Icy Road", "Bridge freezes before roadway" and variants thereof, and "bump" or "dip" ahead (not related to construction). Truck drivers will need to pay attention to "Steep grade" warnings (or "Down grade, use lower gear"), sometimes posted with the percent grade (e.g., 5 percent). Steep hills may also feature "Runaway truck escape" or "Emergency stop" areas with corresponding signs. The UK has a sign warning of "Adverse camber" on a curve. Also "Loose gravel", "Soft shoulder", "Speed hump", and "Watch for Ice." Some warning signs have flashing lights to alert drivers of conditions ahead or remind drivers to slow down. In Britain, they are called warning light. Flashing lights can be dangerous for people with certain forms of epilepsy and/or sensory processing disorder. School zone traffic warning sign in Denmark. France red traffic signal ahead. Crosswalk alert with solar-powered lit outline. Denmark portable multipurpose traffic warning array. School Zone sign with warning light in U.S. Warning signs are also found on other potential dangerous sites. At the base of electricity pylons or fences of substations or radiotechnical equipment with open parts leading high voltage, there are signs warning of high voltage. Warning signs can be found at the top of inclines. "Beware of Dog" is a typical warning of the presence of a dog, but there is no standard sign design. Wikimedia Commons has media related to Wet floor signs. Wet floor signs are used after floor cleaning to warn people about wet floors and to prevent them from slipping and falling. Businesses often place such warnings to avoid negligence charges brought by people on their property. In many countries, if an injury results from a wet floor, the owner of the premises may be found liable for compensatory damages. Many lawyers specialize in such tort lawsuits. Sometimes wet floor signs are not enough. Effectiveness in modifying behavior has been shown to be enhanced when a wet floor warning is also presented aurally every 10 seconds by a tape player. Robotic cleaning equipment can use wet floor signs to know when its job is finished via sonar. One of the oldest known warning signs, from the 1st century AD or BC. It warns non-Jews that they face the death penalty if they enter the Temple. Precautionary statement, definitions of Danger, Warning, Caution, and Notice safety signs. ^ Federal Highway Administration. "Section 1A.13 Definitions of Words and Phrases in This Manual". Manual on Uniform Traffic Control Devices (2003 ed.). Washington, DC. p. 1A–14. Retrieved 2009-03-01. Warning Sign—a sign that gives notice to road users of a situation that might not be readily apparent. ^ "Permanent Warning Signs in New Zealand". 2013-12-05. ^ "CNN - Defendants get 15-year prison sentences for stop-sign killings - June 20, 1997". cnn.com. ^ "Florida Defendants Get Retrial on Manslaughter Convictions Resulting from Deaths at Intersection Where Stop Sign Downed; Dissenting Judge Argues for Acquittal". usroads.com. ^ "Tampabay: Suddenly, stop sign case is over". sptimes.com. ^ "Highway safety sign becomes running story on immigration - The San Diego Union-Tribune". signonsandiego.com. ^ "Driver's Handbook". Archived from the original on 2010-06-11. Retrieved 2009-11-28. ^ Steven Di Pilla (2004-06-02). Slip and Fall Prevention: A Practical Handbook. CRC Press. ISBN 978-1-56670-659-9. ^ "Patent US7013590 - Floor sign - Google Patents". Retrieved 2013-07-06. ^ Larson, Jan (1998). "RoboKent - a case study in man-machine interfaces". Industrial Robot: An International Journal. 25 (2): 95–100. doi:10.1108/01439919810204577. ISSN 0143-991X. Retrieved 2013-03-03.